HCI Books - I Don't Smoke! HCI → I Don't Smoke! Have you attended a smoking cessation program that gave you a good education on tobacco and focused on the cigarette? It's time to try a very different approach to smoking cessation. 'I Don't Smoke!' is about a proven plan that focuses on you—not the nicotine. It's an approach that looks at quitting as a joyous adventure. After all, you're going to be free of a serious addiction—it's like overthrowing a dictator. If you are one of the 47.7 million adult smokers in the United States, chances are you have wanted to—and have tried to—quit smoking. Eighty percent of adult smokers want to quit completely, according to a survey by Gallup and the National Centers for Disease Control and Prevention. But the nicotine in cigarettes is an addictive drug that can make quitting difficult . . . but not impossible. Now from Dr. Joseph Cruse, founding medical director of the Betty Ford Center, comes a program that applies addiction recovery techniques and includes the importance of feelings and increased self-worth. If you want to quit smoking, you can laugh and feel good while you are freeing yourself from your addiction. Using powerful and positive affirmations, retraining your brain, and calling in a virtual army of support from others, this program makes smoking cessation a lifechanging and joyous adventure! There are millions of former smokers who have recovered from their addiction to nicotine. Millions who can now boast, 'I don't smoke! '—and mean it. Take the first step and join them today. This book is not full of depressing statistics on smoking, although some are mentioned. It is not about scaring you with diseases you can get from smoking, although some of those are mentioned. And it's not about shocking you with graphic images of a jarful of tobacco tar or a cancerous lung. Instead, there are some fun drawings. 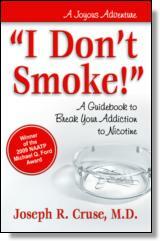 This book is about a very different approach to smoking cessation. It's an approach that focuses on you—not the nicotine. It's an approach that looks at quitting as a joyous adventure. After all, you're going to be free of a serious addiction—like overthrowing a dictator. It's an approach that will make you laugh and feel good while you are freeing yourself from your addiction. Most important, it's an approach that works. People who have used this program had a high success rate at the end of one year. And they had a good time doing it. They can still say, 'I Don't Smoke!' So can you. The approach behind 'I Don't Smoke!' began in 1984 at Onsite Training and Counsulting Counseling, now Onsite Workshops. That year, the company's CEO notified the sixty-five full-time and part-time employees that Onsite staff who used nicotine in any form would be expected to be comfortably nicotine free by November 1985. This would include administrative and clinical staff. Smoking clients were also told that the program and facilities had become smoke free and that an ancillary support program and professional help for nicotine addiction were available to them. At that time Onsite and many other treatment programs had not seriously addressed the problem of nicotine addiction directly. Other drug problems, including alcoholism, eating disorders, and other mental health problems were more important and seemed to take precedence. Both the public and professional thinking was that the problem was just 'smoking,' not addiction. Staff and clients largely accepted the announcement with little disagreement. They knew it was a logical policy, but the smokers were hesitant. They were not happy being caught in the change; the need to stop smoking is scary. But when they took a good look at nicotine dependence as a widespread and powerful addiction with many negative consequences in their lives, their resistance faded. 'I Don't Smoke!' is based on the techniques, theories, practices, and procedures that evolved out of that program change and its philosophy. The results were quite encouraging. In addition to everyone pulling together for the 'new nonsmoker,' the emotional relief and the sharing between smokers and nonsmokers added new dimensions to the program. Therapists were startled to find that those in nicotine withdrawal were more receptive to therapy than when they were 'medicated' with nicotine. The intensity of the work over eight days and the rapid detox with short-term or no nicotine replacement therapy (NRT) allowed most of the participants to return home comfortably free of nicotine. Initial follow-up revealed a 72 percent abstinence rate at the end of one year. This model for recovery from nicotine addiction is based on increasing self-worth, retraining the addicted brain, use of emotions by receiving help from others, and then helping others. Like any adventure, this model requires action. Joseph Cruse, M.D., is an oncologist, addiction medicine specialist, author, writer, and lecturer. He is the founding medical director of the Betty Ford Center. He served as president of the medical staff at Eisenhower Hospital and as a medical director of onsite workshops. He is a consultant to industry, school systems, hospitals, and alcohol and drug treatment centers. He has appeared on 60 Minutes, Good Morning America, and The Late Night Show.